Foundation for Women Warriors has been there for me when I needed it most. This last Spring I was in my final semester of my Bachelors degree at Cal State. I was working and taking a full load of classes while raising my son by myself. I knew that I could not quit school in order to graduate on time. I was having trouble paying for extended care hours at my child’s daycare, with only weeks left to be completed with my degree program. If it were not for this amazing foundation, I would not be a college graduate today. 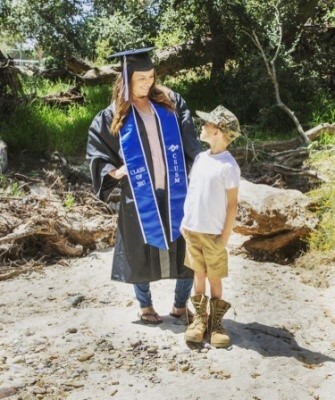 As a Veteran, it is not often we get out of the military and complete college. Many of us get lost in the transition to the civilian world. Often we do not have mentors to turn to while navigating our way through higher education. We usually have taken a less traveled route of serving our country first, then attending college. This can be for many reasons, sometimes we were never told we could go to college or there was no money in the family to send us to college. Foundation for Women Warriors reassured me that I have a support team behind me, encouraging me to accomplish my plan to becoming a medical practitioner. I know that I have mentors in this foundation that I can call on day or night for virtually anything. They have helped me meet other female veterans and assisted me in finding employment. I have found like-minded women that have been through some of the same life events, such as deployment, and PCSing, answering the call to serve their country. I feel a great deal of pride calling this foundation my family and my friends. I used to be afraid to ask for help, but Foundation for Women Warriors did not make me feel ashamed for asking for assistance when my child and I needed it most. They have mentored me, fed me, and treated my son as their own. I know that I have made invaluable life connections with women that lift me up and encourage me.